In my post about Bradwell Priory on Monday I gave the impression that it was not very well endowed. That much is true, but it was not neglected, and there is evidence that in the first 100 years of its life people were willing to make bequests. First up, from around 1230, is a grant from Radulph Barre, then lord of the Manor of Stantonbury. Know all men that Radulph Barre has granted to the chirch of Marie de Bradewelle 9 shillings in annual rents from the lands in Stany Stratford of William Galun, which land was granted to them by Hugo Barre, uncle of the grantor. About 20 years later, there is a small grant of land to pay for the shoes and clothing of the monks. William Vis de Lu of Stratford grants and confirms to the Church of St Mary of Bradwell and the monks serving God out there, to God with the sacristy 3 half-pennies rent p.a. in Wluerthon and in Stratford at 2 terms yearly 1/2d from Jueta widow of Thomas Piston at the Feast of the Nativity, 1/2d from the land at Spitelescroft next the land of William, son of Basil and of the heirs of Willim Ferrarius with 1/2d at the feast of St Mary in March from half acre in Fuleweelslade next land of Thomas the clerk and from William Fule. from 1/2 9indecipherable) abutting on the garden of John de Haue. Free of all service, etc, wardship, escheat etc. There is more but I won’t bore you too much. The flavour of all these grants is that they are all tiny piecemeal additions to the Priory’s property. A “rod”, sometimes known as a perch or a pole, is a length of only 5.5 yards or 16.5 feet – little more than a small garden plot. What Bradwell Priory lacked throughout its unspectacular history was a significant bequest that could move it into a bigger league. As a small boy I remember being taken down to Abbey Farm. There were some old stone buildings there but at the age I was then it was meaningless to me. I did notice the pigs, however. When I went back there about twenty to thirty years later, the pigs were gone and there were a number of people beavering away to reveal floor tiles and wall paintings. Bradwell Priory was being reclaimed. The founndation came from Meinfelin, the second Baron of Wolverton. He seems to have lived to a good age and he may have consolidated the wealth of the barony. At any rate he had sufficient wealth to endow the Priory of Bradwell in his will of 1155. This, sad to relate, may have been the high point of the history of the Priory. The original endowment gave the new Priory some land in Wolverton and Padbury and the churches of Stantonbury, Wolverton, Padbury, Chalfont St Giles and Stoke Hammond. Before too many years passed the Stantonbury church was lost to the Cathedral of Lincoln and the income from the church at Chalfont St Giles in 1259 and there were also disputes about payment from the church at Padbury. The Black Death of 1349 appears to have decimated the number of monks, although there is no precise figure. The buildings were reported to be dilapidated in 1361 and the office of Prior was not filled for some years after that. Apparently the names of the priors between 1410 and 1492 are unrecorded. The income for the priory in 1291 amounted to £10 19s 6d and at dissolution in 1524, when you can be sure that Cromwell’s commissioners accounted for every penny, the income was £47 4s 11/4d. There is some evidence that the priory held properties in Little Billing and Northampton which suggests that the Longuevilles may have come to its aid from time to time, but the overall picture is that of an institution which was never able to attract the endowments it needed to thrive in the 13th and 14th centuries. The property was surveyed in 1526 and in February 1528 the King formally granted the site and its precincts to Cardinal Wolsey. It must have quickly reverted to the Longueville family of Wolverton who had a long-term interest in Bradwell manor. It appears that they rented it at first and then purchased the property. The date of this transaction is not known. The Longueville involvement continued until 1666 when it was sold to the Alston family. The change of ownership may have led to enlargement of the 16th century hall. 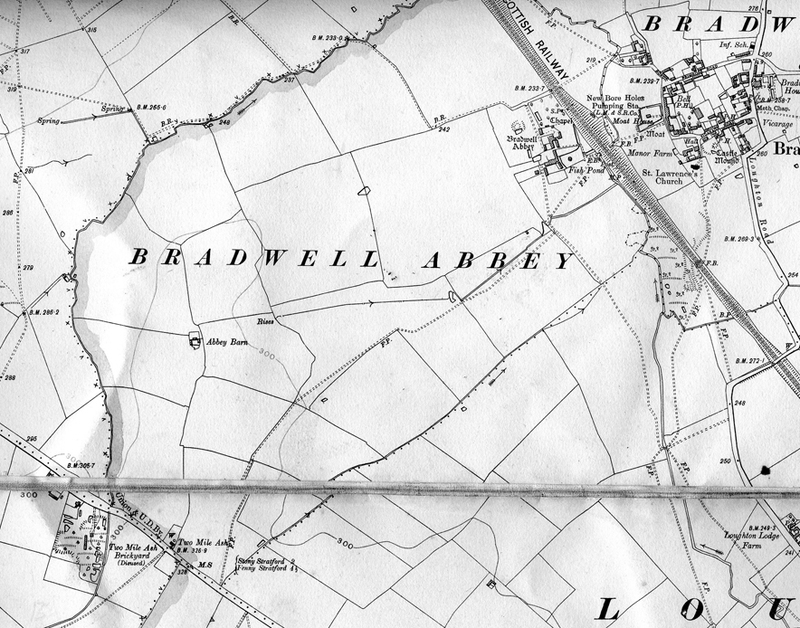 The name Bradwell Abbey probably came about after the monastic dissolution when the new owners of former religious houses wished to magnify their status. Very little of the medieval property survives intact. The small chapel, dedicated to St. Mary is about the only part to which one can ascribe a medieval heritage. It continued in use as a chapel until the 18th century but by 1798 it was used as a farm building – which is how I remembered it from my first encounter.